Everyone is entitled to their own opinion, right? Maybe not. Before I proceed, let me preface this post stating my personal position in mathematics education. If one drew a line in the sand with constructivist theory with its implications on learning on one side, and cognitive psychology and its implications on learning on the other, I would definitely find myself on the latter side. Not to say that I do not find myself utilizing some ideas from constructivist theory; but I certainly consider myself more aligned with cognitive psychology. Now, with this said, I wish to share a story from last week. I came across this site through a tweet on my feed. It is a cute page giving teachers some ideas for maths-related activities that tie to art. I, however, saw it the other way around: the activities were actually art projects that drew in mathematics. Willingham is showing us that teachers need to be critical of what their students are going to think about during a learning activity. For nearly all of the activities given in the link above, the mathematics is the after-thought of the activity. For example, in “musical fractions” students are primarily going to be thinking about the music, or perhaps the colours, and little about the fractions. I found it rather odd to come home to these two tweets from Dan Meyer. Perhaps Dan was simply having a bad day. Although, one could argue otherwise: we do not follow each other, and I did not hashtag my original tweet, so he really had to go out of his way to find this tweet to quote it. Either way, I find his arguments rather off-putting. Where did I oppose any ideas? I was simply stating my opinion on the matter – using my 21st century critical thinking skills to connect what I have learned to a real-life situation, to be exact. Second, notice that he attacks the character of the mathematics community. What does this comment add to the discussion? To me, it shows me that he and his following are less interested in actually having a discussion about my position on the original tweet, and more interested in painting a false image of myself and the mathematics community. Again, maybe this was not his intention at all, but this is how I see the conversation. As such, I left him a cheeky response. What is even more baffling to me, are some of the responses Dan got on his initial tweets. As I mentioned earlier, I doubted that any of Dan’s following actually intended to have a conversation with me. I, however, still replied to some stating my viewpoint to no avail. In all honesty Tom, I doubt reading Dan’s blog will help me discover why he thinks an ad hominem attack is necessary in this situation. Again, it seems these fellows (Kyle and Ian) have missed the original opinion. One must critically think about what the students will be thinking about in the lesson. My opinion was that most students would walk away from these activities answering the question “What did you learn in maths today?” with nothing related to mathematics. Kyle, this has nothing to do with enjoyment. Students may very well enjoy these activities, but this does not mean that they will walk away having learned any mathematics. Ian, again I have made no mention of never connecting maths to anything else. In fact, I mention in my first tweet that these would be great activities to bring mathematics into an art class! My my, we have really explored the depths of confirmation bias now, haven’t we? School is really important. It is the perfect age for society to help children learn biologically secondary knowledge, or the knowledge that our culture wishes to impart on our young learners. If students fail to acquire the necessary foundations for mathematics in elementary school (by consistently seeing art lessons dressed up as mathematics lessons, for example), they are constantly playing “catch-up” in the later years, and can miss out on opportunities to advance in a STEM field (this is actually quite an issue in North America). So no, I do not agree saying “Chill out, school isn’t soooo important.” will work here Michael. Now that we have taken time to rile ourselves up, let’s jump out of the fire for a moment and debrief. The major question brought to mind for me was “Are there other teachers with similar beliefs as me that are treated equally as unfairly?” And more importantly, if the answer is yes, then why is this the case? Perhaps, in order for these individuals to feel successful, they must have a cohort whom they can call “the other.” Utilizing another cohort as “the other” and painting this cohort in a certain way allows their positions to be justified. For example, note that I represented the “bad way” of thinking and was branded “the other” in Dan’s initial tweets. This allowed him to justify his underlying message of “my way of thinking is better.” And this underlying message is seen in several of the other comments from his followers that I have posted above. Are either of our views the “best” way to think? Probably not, but as soon as I am branded as “the other” then there is a distinct victor. Also notice that the labelling of “the other” creates a power differential between the two cohorts – when Dan branded me as “the other”, members of his cohort felt completely comfortable verbally attacking my character rather than criticising my opinion. There is a distinct difference here: critiquing my opinion means coming at me as an equal who is willing to discuss; insulting my character/cohort means you are attempting to put yourself unrighteously and psychologically superior to me. 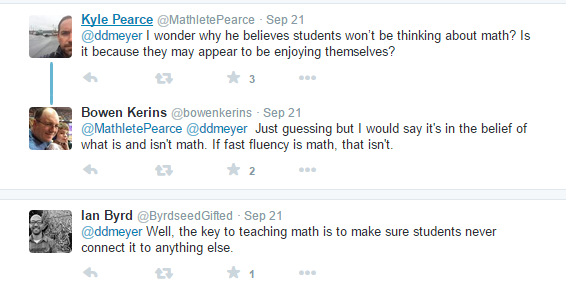 This unfortunately seems to be a common trend in mathematics education currently. I believe there is some kind of middle-ground to be sought; however, we cannot get there if we consistently are searching for the psychological upper-hand in the discussion. So it seems to me that it’s not only maths class that needs a makeover, but our way of communicating freely and respectfully with each other. Some food for thought; I wrote about the challenges of this inquiry-based/constructivist approach in the classroom. I enjoyed your post, Bryan. I generally find myself agreeing more with the constructivist “cohort.” However, as a classroom teacher, my practice was never about camps or cohorts but rather what was best for the students in front of me. If I only lectured to my students, some would be successful and some would not (not that I think you are advocating for only lecturing). If I only used inquiry and problem based learning, some would be successful and some would not. The bottom line, in my opinion, is that teachers need to have an array of pedagogical and assessment practices which will help maximize student learning. I think both you and Thom have made some valid points. Personally, I quite enjoy following your twitter feed since I don’t necessarily agree with everything you say! It certainly keeps my mind open to thinking outside of my box, and I feel I have grown in my own thinking over the past year (so thank you for this!). Do you ever get that “I am so angry at this idea!” moment on Twitter? I used to get those quite a bit, and often would lash out without really thinking. I have noticed myself being a bit more level-headed about items that give me those moments now, giving myself time to think more about it. I feel as though perhaps Dan was having one of those moments when he read my initial tweet, and replied without allowing himself to step back for a moment to realize the underlying critique I was sending out. I definitely have those moments, particularly when I feel someone is attacking the person rather than evaluating the ideas. Education is a value laden and emotional field so it is bound to happen. Like you, I am trying to take a more measured approach. I too appreciate your thoughts, Brian. We don’t always agree and that’s OK. Your twitter feed and those of some of your colleagues pushes my thinking. I usually end up with a giant reading list!! So for that, thanks! Interesting read, and I appreciate your insights. I’m a pretty big advocate for inquiry-based learning (or ‘constructivist approach’ as you called it…which I believe is the same thing). I think it’s another of those unfortunate cases of people dialoguing online in a manner which they wouldn’t do in real life. Also a case of demonizing anyone with a hint of something they’re against- as people saw your comment and equated you with someone who loves to drill and kill, lecture all day, spoon feed students, and teach to the test all because you questioned the use of a few ‘art-integration’ activities. As wonderful as the internet is, it’s often a poor place for real discussions. As valuable as I find many teacher Twitter chats, I see a trend in them becoming a place where everyone pats each other on the back for having the same idealogies.